The Hermitage in Waghäusel is a baroque castle, arranged around an octagonal central building, which was built by Michael Ludwig Rohrer at the behest of prince-bishop Damian Hugo of Schönborn from Speyer between 1724 and 1729. From around 1737 onwards, Balthasar Neumann added four risalit-like wings to the core building. Then he added four elongated front buildings – so-called Kavaliershäuser - to the cross shaped complex, which he placed along the bisecting lines of the wing houses. The whole complex owes its existence to an immediately adjacent former pilgrim monastery, which was very popular at that time. After its secularization the sugar company Südzucker bought the deserted building in 1837 and erected a new sugar factory right next to the complex. Until 15 years ago, the old hermitage buildings served the sugar company as administrative centre. 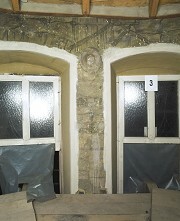 The northern „Kavaliershaus“ was only recently discarded for an expansion of the factory. While the production halls have been falling apart for quite some time now, the hermitage building is currently being extensively renovated. In June 2004 the central dome was completely rebuilt. 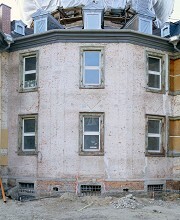 It was my task in the context of the building research conducted by the office P. Knoch to document the frescos on the inside of the tambour, the complete outside facade after removal of all plaster, as well as the uncovered baroque drainage system by the means of photographs and partly with photogrammetric methods.